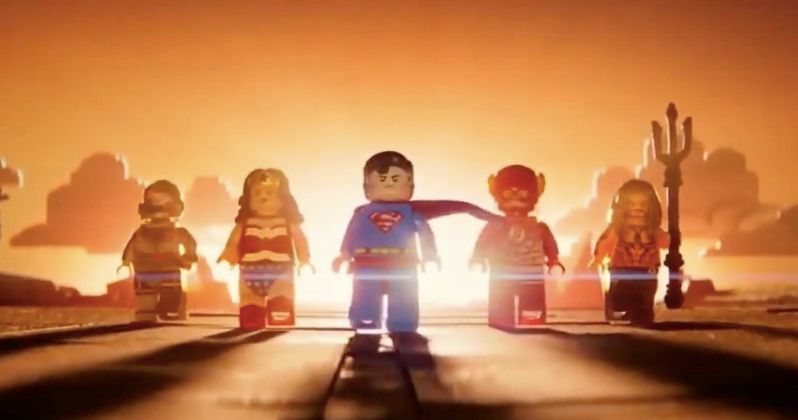 A brand new TV spot for The LEGO Movie 2: The Second Part is here and it's bringing the Justice League along for the ride. It's been a few years since we first encountered Emmet and the citizens of Bricksburg in the first LEGO movie, but the highly-anticipated sequel is finally coming our way in 2019. Now, we've got a little bit of new footage showcasing some of DC's biggest heroes who are getting in on the action to help save the day. The TV spot reveals that all is not well these days as the happy world we left off with last time is now a Mad Max style wasteland. Emmet is going to have to save his friends from aliens, but he's not going to be able to do it alone. The spot gives us a glorious shot of the Justice League suited up and ready for action. Superman, Batman, Aquaman, Wonder Woman and The Flash are all reporting for duty. Oh, and Green Lantern, who almost gets left behind. Two members of the live-action Justice League will be present in The LEGO Movie 2, with Gal Gadot voicing Wonder Woman and Jason Momoa voicing Aquaman. As we can hear quite plainly in this new spot, Jonah Hill will once again be voicing Green Lantern, which means we should expect to hear Channing Tatum as Superman once again. Will Arnett will also be returning as Batman, since he was not only a big part of the first movie, but he also led his own very successful spin-off with The LEGO Batman Movie. In The LEGO Movie 2: The Second Part, the citizens of Bricksburg face a dangerous new threat when DUPLO invaders from outer space invade, carving a path of destruction in their wake. Looks can be deceiving. The battle to defeat this new threat and restore harmony to the LEGO universe takes our heroes to far away, unexplored worlds that will test their courage and creativity. The core voice cast including Chris Pratt, Elizabeth Banks, Nick Offerman and Alison Brie are all returning. They'll be joined this time by Girls Trip star Tiffany Haddish, who is voicing the main villain. The first LEGO movie has a huge hit, grossing $469 million worldwide and garnering a great deal of critical acclaim. Phil Lord and Chris Miller aren't directing this time around, but they are still on board as producers. Instead, it's Mike Mitchell, who previously helmed Trolls and The SpongeBob Movie: Sponge Out of Water, in the director's chair, working from a script by Lord, Miller and Raphael Bob-Waksberg of BoJack Horseman fame. Who knows? Maybe this will end up giving us all the Justice League movie we were hoping for last year. The LEGO Movie 2: The Second Part hits theaters on February 8, 2019. Be sure to check out the new TV spot from Warner Bros. below.